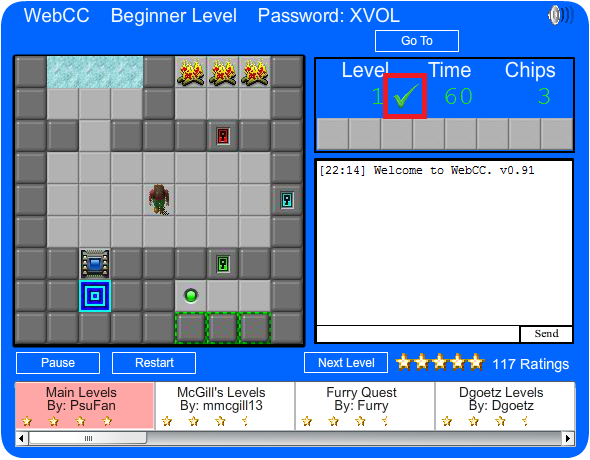 You now can know for certain that a level is solvable. Just look for the green "check" next to the level number! To all map makers: you will lose the "check" when your level, chips, or time is modified. You will have to solve your level again to receive the "check" back. At this time, only moderators and developers can submit checks. Time to play all my levels! This should be fun! how does one become a developer here? LOL!, Well, Kishi, you have more seniority than I do. I'm surprised I don't see the "D" word under your name too. Now to go work on my acceptance speech . . .
LOL.... i wish i had 'd' too. wud have enjoyed marking green n red marks !! Wow an acceptance speech, cool. heyyy !! thts great...i am pleasantly surprised. thanks psufan. Oh I am excited! Welcome to the ranks girls! It is very exciting to have you guys be developers too. Now we just have to kidnap Uncle Charlie and we are a gang. I dont know who you are talking about. Seems that I have also been accorded that honour since I just saw a check mark appear on some levels I tried out. I like to run through various user levels partly to see which ones seem to have a grasp of what makes for good play and partly, I have to admit, to get new ideas for my own levels. Really neat to see levels getting the green light. I am having fun with it. Putting green checks on levels that I played that are not in the public pack at all. Will the checks add up if enough of us play them?